Cosy House Collection - Helps keep you cooler in summer, warmer in winter & comfier all year 'round! Naturally hypoallergenic: allergy troubles? Breathe easy! These sheets resist pollen, dust mites & even harmful bacteria. So, it stays snug all night - no more annoying ride-up. With their luxe bamboo/microfiber blend, they're much softer & silkier than sheets that cost far more Made with a carefully crafted 40% Bamboo blend sourced from fast growing & renewable, our bamboo is totally eco-friendly. You get the luscious feel of bamboo PLUS the silky feel of microfiber. Plus, it has elastic all around, not just at the corners. Result: skin-caressing comfort. Breathably cool: did you know that bamboo absorbs moisture 4 times better than cotton? Wicks & evaporates, too. Guaranteed, so order risk free your Cosy House Set comes in a chic zippered tote, perfect for tasteful gifting. 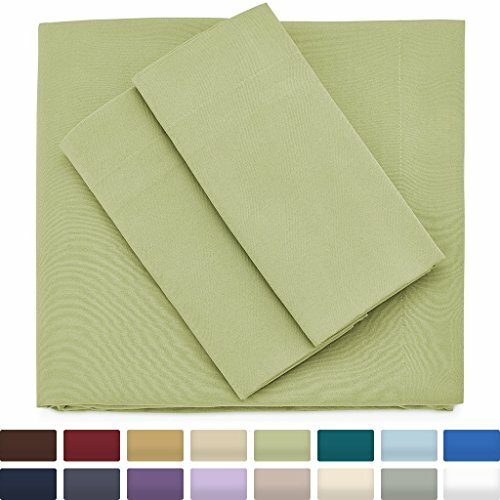 Premium Bamboo Bed Sheets - 4 Piece - Queen Size, Sage Green Sheet Set - Hypoallergenic Blend From Natural Bamboo - Ultra Soft Cool Bedding - 1 Fitted, 1 Flat, 2 Pillow Cases - Deep Pocket - It all adds up to blissful comfort easy care - just toss in the wash Resistance to stains, wrinkles & pilling Fine single-needle tailoring for an elegant, high-end look ALL at an affordable price! Perfect for Any Bed Have a deep-pocket mattress? No worries. They also resist stains & wrinkles, so they look as good as they feel. Ideal for deeper mattresses: at 60" x 80", it's elasticized all around, our fitted bottom sheet will easily fit your oversize mattress up to 16" deep. At the same time, they're stronger than cotton for lasting durability. Our smooth fitted sheet fits mattresses up to 16" deep. Cosy House Collection - No risk - we believe in the quality of our fabric so much that we offer 100% satisfaction guarantees for the lifetime of our products. If you don't fall in love with your purchase, simply message or call us and we will go above & beyond to make things right with you- whether that's a full refund or a replacement, there'll be no questions asked. Just read our reviews in our entire product line! We are only satisfied when you are. Choose the matching color and size for your pillows today! We would love to have you in our Cosy family. Additionally this fabric blend has desirable properties such as stain resistance and breathing ability. We guarantee no ripping, piling, or shrinking after machine washing and drying. Standard, Sage Green Pillow Case Set of 2 - Ultra Soft & Cool Hypoallergenic Blend from Natural Bamboo Fiber - Cosy House Collection Premium Bamboo Pillowcases - They are also wrinkle, and fade resistant! Ultra-strong - our 40% bamboo blend with 60% microfiber is softer and stronger than cotton! It's crafted to be extremely durable and last it's full lifetime. With our tightly-woven fabric blend we guarantee extra strength and durability. Pillowcase measures 20" x 30". It stays cooler than cotton and is thermal regulating, which balances your body heat as you sleep. Wear & Tear Resistant. Antibacterial - our hypoallergenic pillowcases do triple-duty by wicking away moisture, stain, oils, odor, and bacteria for better hygiene and health. Cosy House Collection - We guarantee no ripping, piling, or shrinking after machine washing and drying. Antibacterial - our hypoallergenic pillowcases do triple-duty by wicking away moisture, stain, odor, and bacteria for better hygiene and health. Wear & Tear Resistant. Antibacterial - our hypoallergenic pillowcases do triple-duty by wicking away moisture, oils, stain, odor, and bacteria for better hygiene and health. They are also wrinkle, and fade resistant! Ultra-strong - our 40% bamboo blend with 60% microfiber is softer and stronger than cotton! It's crafted to be extremely durable and last it's full lifetime. No risk - we believe in the quality of our fabric so much that we offer 100% satisfaction guarantees for the lifetime of our products. Cosy House Collection Premium Bamboo Pillowcases - King, Sage Green Pillow Case Set of 2 - Ultra Soft & Cool Hypoallergenic Blend from Natural Bamboo Fiber - If you don't fall in love with your purchase, simply message or call us and we will go above & beyond to make things right with you- whether that's a full refund or a replacement, there'll be no questions asked. Affordable luxury - high quality bamboo bedding - designed by Serenity Experts! Sleep Cosy in our silky soft naturally indulgent bamboo blend which is even softer than Egyptian cotton, giving you skin-caressing comfort every night at an affordable price! It stays cooler than cotton and is thermal regulating, which balances your body heat as you sleep. Additionally this fabric blend has desirable properties such as stain resistance and breathing ability. Light & cool - enjoy the cool side of the pillow all night long! Our unique fabric is the most breathable and crisp fabric out there. They are also wrinkle, oils, and fade resistant! Cosy House Collection - Wear & Tear Resistant. At the same time, they're stronger than cotton for lasting durability. Pillowcase measures 20" x 40". It stays cooler than cotton and is thermal regulating, which balances your body heat as you sleep. Guaranteed, so order risk free your Cosy House Set comes in a chic zippered tote, perfect for tasteful gifting. They are also wrinkle, oils, and fade resistant! Ultra-strong - our 40% bamboo blend with 60% microfiber is softer and stronger than cotton! It's crafted to be extremely durable and last it's full lifetime. We guarantee no ripping, piling, or shrinking after machine washing and drying. Light & cool - enjoy the cool side of the pillow all night long! Our unique fabric is the most breathable and crisp fabric out there. Queen, Tan - 1 Fitted Sheet, 1 Flat, 2 Pillowcases - 4 Piece - Resists Wrinkles - Hypoallergenic Bedding Blend from Natural Bamboo Fiber - Cosy House Collection Luxury Bamboo Bed Sheet Set - . No risk - we believe in the quality of our fabric so much that we offer 100% satisfaction guarantees for the lifetime of our products. If you don't fall in love with your purchase, simply message or call us and we will go above & beyond to make things right with you- whether that's a full refund or a replacement, there'll be no questions asked. Oustanding! high quality 60% bamboo and 40% microfiber Blend - Feels softer, more comfortable, and greater bamboo content than most bamboo bed sheets on the market. Our smooth fitted sheet fits mattresses up to 16" deep. With their luxe bamboo/microfiber blend, they're much softer & silkier than sheets that cost far more Made with a carefully crafted 60% Bamboo blend sourced from fast growing & renewable, our bamboo is totally eco-friendly. Cosy House Collection - Our bamboo protective cover is the best shield against bacteria, allergens, and dust mites because it naturally wicks away moisture and prevents these germs from growing in your bed. Satisfaction guarantee: we're so confident in the quality of our products that we always offer a 100% money back guarantee for the lifetime of the product. Revolutionary! regenerated cellulose fiber from rayon delivers the key to regulate heat making it breathable and naturally hypoallergenic like the best bamboo beddings. No risk - we believe in the quality of our fabric so much that we offer 100% satisfaction guarantees for the lifetime of our products. If you don't fall in love with your purchase, simply message or call us and we will go above & beyond to make things right with you- whether that's a full refund or a replacement, there'll be no questions asked. Queen Size Luxury Bamboo Hypoallergenic Waterproof Mattress Protector - Protection Against Stains, Fluids, Dust Mites, Allergens, Bacteria - Breathable Noiseless Fitted Bed Cover Stays Cool - Oustanding! high quality 60% bamboo and 40% microfiber Blend - Feels softer, more comfortable, and greater bamboo content than most bamboo bed sheets on the market. Our special, double-layer membrane technology absorbs any mess to completely protect your mattress. Hypoallergenic & antibacterial: beds are generally a huge breeding ground for bacteria. If you don't love your new mattress protector, let us know and we'll go overboard to make things right with you. Ultra-soft mattress protection: keep your mattress feeling brand new for years with our hypoallergenic bamboo fabric protector. Make sure to not use high heat settings as this will damage the waterproof membrane. Cosy House Collection - They are also wrinkle, and fade resistant! Ultra-strong - our 40% bamboo blend with 60% microfiber is softer and stronger than cotton! It's crafted to be extremely durable and last it's full lifetime. It stays cooler than cotton and is thermal regulating, which balances your body heat as you sleep. At the same time, they're stronger than cotton for lasting durability. Plus, it has elastic all around, not just at the corners. Excellent! best customer service in the market - we answer all customer concerns within 24 hours and makes you feel confident on your purchases with our 100% Money Back, if not satisfied - Part of our Lifetime Satisfaction Guarantee. Antibacterial - our hypoallergenic pillowcases do triple-duty by wicking away moisture, stain, oils, odor, and bacteria for better hygiene and health. 1 Fitted Sheet, 1 Flat, 2 Pillowcases - Cosy House Collection Luxury Bamboo Bed Sheet Set - Resists Wrinkles - 4 Piece - Hypoallergenic Bedding Blend from Natural Bamboo Fiber - Queen, Purple - It stays cooler than cotton and is thermal regulating, which balances your body heat as you sleep. Guaranteed, so order risk free your Cosy House Set comes in a chic zippered tote, perfect for tasteful gifting. Wear & Tear Resistant. What's more, when it's made into viscose rayon, it: feels lusciously soft - some people compare it to cashmere! Breathes for refreshing coolness Wicks & evaporates moisture fights germs it's antimicrobial Resists pollen & dust mites it's hypoallergenic, too! Plus 40% Microfiber Spun ultra-fine, our microfiber yarns are even softer than silk. Light & cool - enjoy the cool side of the pillow all night long! Our unique fabric is the most breathable and crisp fabric out there. They are also wrinkle, oils, and fade resistant! Zen Bamboo RG-ZB4PCSHT-CRM-Q-R - Cold wash and low heat dry to avoid piling. Say goodbye to dust mites, and comfortable bedding! Easy care & machine washable - our sheets are machine washable and easy to care for. Crafted with 70% natural bamboo rayon and 30% polyester, bacteria, this strong yet soft material eliminates allergens, and dust mites entirely. Quiet & cooling: this stretchable fabric is designed to silently stay in place all night, even with movement in the bed. These bamboo sheets are in high demand and sell out fast. It stays cooler than cotton and is thermal regulating, which balances your body heat as you sleep. Ultra-soft mattress protection: keep your mattress feeling brand new for years with our hypoallergenic bamboo fabric protector. Zen Bamboo 1800 Series Luxury Bed Sheets - Eco-friendly, Hypoallergenic and Wrinkle Resistant Rayon Derived From Bamboo - Queen - 4-Piece - Cream - No itching or rough fabric against your skin. Wear & Tear Resistant. Excellent! best customer service in the market - we answer all customer concerns within 24 hours and makes you feel confident on your purchases with our 100% Money Back, if not satisfied - Part of our Lifetime Satisfaction Guarantee. Order yours today and sleep great in comfort and ultra high end luxury. Revolutionary! regenerated cellulose fiber from rayon delivers the key to regulate heat making it breathable and naturally hypoallergenic like the best bamboo beddings. Pillowcase measures 20" x 30". Our special, double-layer membrane technology absorbs any mess to completely protect your mattress. HILLFAIR Cotton-Blanket-Beige-Queen - We guarantee no ripping, piling, or shrinking after machine washing and drying. Pillowcase measures 20" x 30". Amazing! guaranteed perfect fit to your queen sized bed - flat sheet 102" x 90", Fitted 80" x 60" with deep pockets up to 16 inches and 2 Pillowcases 20" x 30". Light & cool - enjoy the cool side of the pillow all night long! Our unique fabric is the most breathable and crisp fabric out there. It stays cooler than cotton and is thermal regulating, which balances your body heat as you sleep. Breakthrough! strong elastic and tightly-knit threads permits the sheets to stay on bed throughout the night and won't rip or have loose threads after a couple of uses. Ideal for layering with any bedding ensemble. If you are unsatisfied, simply contact us to return the product for a full refund. Queen thermal cotton Blanket Size: 90 inch by 90 inch. Made from natural materials and no harmful chemicals and synthetic materials are added, which is safe for you and your family. And with an array of colors to choose from, stylish, there's something for everyone! HILLFAIR 100% Soft Premium Combed Cotton Thermal Blanket– Queen Blanket– Soft Cozy Warm Cotton Blanket– Bed Throw Blanket– Queen Bed Blankets– All Season Cotton Blanket– Beige Queen Cotton Blankets - High quality brushed bamboo & microfiber blend - our sheets are crafted in the highest quality material, they're 40% rayon derived from bamboo and 60% brushed microfiber, so you know they'll stand the test of time! Designed with excellence in mind, making them incredibly plush and more durable than standard cotton sheets. Hypoallergenic & stain resistant - our sheets are hypoallergenic, wrinkles, and hello to cozy, stain resistant, soft, and tedious tasks like ironing, fade resistant, and wrinkle resistant. Breakthrough! strong elastic and tightly-knit threads permits the sheets to stay on bed throughout the night and won't rip or have loose threads after a couple of uses. Zen Bamboo RG-ZBPILWCSE4PC-STD-CRM-S - Satisfaction guaranteed - we are so confident in the quality of our product that we offer a 30-day satisfaction guarantee. Breakthrough! strong elastic and tightly-knit threads permits the sheets to stay on bed throughout the night and won't rip or have loose threads after a couple of uses. These luxurious pillowcases stay wrinkle free with no ironing required and are a perfect addition to any bed set! frustrated with buying colorful bedding only have to replace it due to fading and discoloration? These pillowcases are fade resistant and look brand new for years to come! Our pillowcases are machine washable for easy cleaning, and can be simply tumble dried - no ironing or expensive dry cleaning required!Don't wait - order your Zen Bamboo Pillowcases today! Affordable luxury - high quality bamboo bedding - designed by Serenity Experts! Sleep Cosy in our silky soft naturally indulgent bamboo blend which is even softer than Egyptian cotton, giving you skin-caressing comfort every night at an affordable price! Pillowcase measures 20" x 30". Ideal for all seasons: soft and cozy durable for long use. We guarantee no ripping, piling, or shrinking after machine washing and drying. Cold wash and low heat dry to avoid piling. Crafted with 70% natural bamboo rayon and 30% polyester, this strong yet soft material eliminates allergens, bacteria, and dust mites entirely. Premium, Eco-friendly, Hypoallergenic, and Wrinkle Resistant Rayon Derived From Bamboo - Cream - Standard/Queen - Zen Bamboo Ultra Soft Pillow Case 4 Pack - Quiet & cooling: this stretchable fabric is designed to silently stay in place all night, even with movement in the bed. Easy Care machine washable. Hotel Sheets Direct HSD_BMB_FULL_LIGHT_BLUE - Hotel sheets direct 100% bamboo sheets use the highest quality bamboo fabric which is 60x40 173x120 144gsmWhy buy blended bamboo sheets with more microfiber than bambooOther bamboo sets often contain more microfiber than actual bamboo. Crafted with 70% natural bamboo rayon and 30% polyester, this strong yet soft material eliminates allergens, bacteria, and dust mites entirely. Quiet & cooling: this stretchable fabric is designed to silently stay in place all night, even with movement in the bed. Light & cool - enjoy the cool side of the pillow all night long! Our unique fabric is the most breathable and crisp fabric out there. Light & cool - enjoy the cool side of the pillow all night long! Our unique fabric is the most breathable and crisp fabric out there. Hotel Sheets Direct 100% Bamboo Bed Sheet Set Full, Light Blue - They are also wrinkle, and fade resistant! Ultra-strong - our 40% bamboo blend with 60% microfiber is softer and stronger than cotton! It's crafted to be extremely durable and last it's full lifetime. Bamboo is a hardy plant that is anti-microbial, thermoregulating cool when its hot and warm when it is cold, and does not need pesticides. Sleep challenge - if you aren't satisfied with our sheets for any reason, flat sheet, return them for a full refund within 90 days. Set contains a fitted sheet, and 2 standard pillowcases. No risk - we believe in the quality of our fabric so much that we offer 100% satisfaction guarantees for the lifetime of our products. If you don't fall in love with your purchase, simply message or call us and we will go above & beyond to make things right with you- whether that's a full refund or a replacement, there'll be no questions asked. Cosy House Collection - These luxurious pillowcases are the perfect finishing touch to your bed set. Ultimate comfort- the silky smooth and soft feel of our bamboo blend will keep your head cool and comfortable year-round. Fade resistant- frustrated with buying colorful bedding only have to replace it due to fading and discoloration? Our pillowcases were designed with long term durability and fade resistance in mind. Easy to clean- our pillowcases are machine washable for easy cleaning and can be tumble dried on a low or medium heat setting. Cold wash and low heat dry to avoid piling. No risk - we believe in the quality of our fabric so much that we offer 100% satisfaction guarantees for the lifetime of our products. If you don't fall in love with your purchase, simply message or call us and we will go above & beyond to make things right with you- whether that's a full refund or a replacement, there'll be no questions asked. 1 Fitted Sheet, 1 Flat, 2 Pillowcases - Resists Wrinkles - Cosy House Collection Luxury Bamboo Bed Sheet Set - 4 Piece - Queen, Cream - Hypoallergenic Bedding Blend from Natural Bamboo Fiber - Affordable luxury - high quality bamboo bedding - designed by Serenity Experts! Sleep Cosy in our silky soft naturally indulgent bamboo blend which is even softer than Egyptian cotton, giving you skin-caressing comfort every night at an affordable price! Light & cool - enjoy the cool side of the pillow all night long! Our unique fabric is the most breathable and crisp fabric out there. Wear & Tear Resistant. Excellent! best customer service in the market - we answer all customer concerns within 24 hours and makes you feel confident on your purchases with our 100% Money Back, if not satisfied - Part of our Lifetime Satisfaction Guarantee. Our sheet set is luxurious, and the softest sheets you'll ever own.